Overview: Hepatitis B virus (HBV) is a relatively small, partially double-stranded, enveloped DNA virus and a member of the Hepadnaviridae (hepa = liver, dna = deoxyribonucleotide, viridae = virus) family of hepatotropic viruses, that causes hepatitis (Figure 1). Generally, the term hepatitis decribes any inflammation of the liver, caused by a virus or a toxin such as alcohol, and characterized by jaundice, liver enlargement, and fever. Today, hepatitis B remains a major global concern. The portion of the world’s population currently infected with the virus is estimated at 3 to 6 percent, far greater than 0.6 percent of the world infected with HIV. Figure 1. 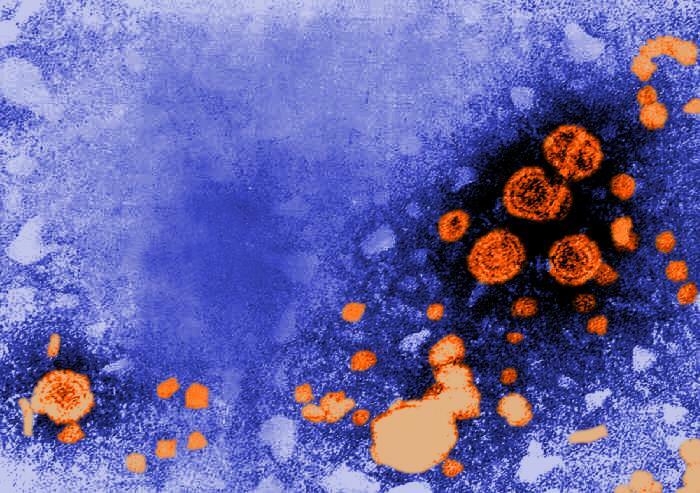 This digitally-colorized transmission electron micrograph reveals the presence of hepatitis B virions. The large round virions are known as Dane particles. Hepatitis B virus genome (genetic make-up) is unique in that the minus-strand is full length, while the plus-strand is less than full length, leaving 15% to 50% of the molecule single-stranded or uneven. Its DNA is 3020 to 3320 nucleotides long (for the full length strand) and 1700-2800 long (for the shorter strand) (Figure 2). Its genomic circularity is maintained by 5’ (five prime) cohesive ends linked to viral DNA polymerase (Büchen-Osmond, 2006). Figure 2. Hepatitis B virus DNA. The attachment of DNA polymerase to the genome's five prime end is not shown. Hepadnaviridae viruses are characterized by their unique mode of replication, which involves using an RNA template for DNA synthesis (see Pathogenesis) even though it is a double-stranded DNA virus. The DNA is housed within an isometric nucleocapsid that is surrounded by an envelope 42 to 47 nm in diameter, made of host lipid membrane. This spherical envelope sometimes extends into a tubular tail of filamentous particles. HBV is also one of the smallest viruses to infect humans (Baron, 1996). Hepatotropic - Having a special affinity for or exerting a specific effect on the liver.